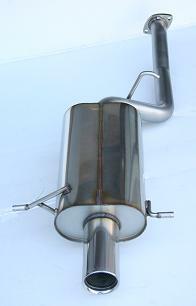 Direct bolt on 2.5" Rear Muffler w/3.5" resonated single tip. Mild deep tone 6 hp increase w/smoother stronger acceleration. Bolts directly to stock intermediate pipe or optional Stromung 2.5" intermediate pipe for increased sound.